Break-ups, make-ups, babies, weddings and more! With the new season of Married at First Sight just around the corner and a new bunch of couples about to enter the experiment, it truly is an exciting time for anyone with a MAFS obsession. But while we're excited for the next instalment, it does make us nostalgic about brides and grooms gone by - and how they fared after the popular show. While there's only one couple left standing in five seasons (ahem, Erin Bateman and Bryce Mohr) we know that the strike rate is a little less than ideal - but you'll be happy to know, that a lot of your favourites have moved on and found happiness and all we can say is: baby, baby, baby! RELATED: Are the Married At First Sight weddings actually legal? After breaking up with her original 'hubby' Dean, Tracey arrived at the final dinner party with co-star Sean Thomsen, who was originally coupled with Blair Rachael. The pair later split, and Tracey moved on with a former lover, Patrick Kedemos, only to break up with him in August. "I really wanted to find love, but I wouldn't change my experience for the world," Tracey, 35, says. "I'm grateful for it. Here's to new beginnings!" As for Tracey's arch rival Davina – who was caught exchanging flirty messages with Dean – she's happy to take a step back. "The show was a bit of fun at the time, but the backlash was brutal," Davina, 28, who's now living with Brisbane businessman Jaxon Manuel, says. "I've had lots of offers from TV shows and spin-offs, but to be honest, I'm content with my life as it is," she admits. "I'm excited to build a future with Jax, without being so 'in the spotlight'." Fans were thrilled when city slicker Christie Jordee and "farmer Mark" Hughes decided to stay together after the show. But the distance was too much, with Christie based in Sydney and Mark on a property in rural Victoria, and they soon called time on their romance. After their break up, Christie told Now To Love how much she had learnt from her relationship with Mark. "We stayed together [after the show] and obviously everyone loves the couples that stay together. We were on this massive high but the relationship was breaking down dramatically," Christie explains. "I had people abusing me, saying they deserved to know if we had broken up because we were on TV. When we announced our split, people were calling me a stupid woman. It was such a frustrating time." Although she was falling for him, in hindsight Christie admits they were never compatible. "Couldn't people see from the beginning it wasn't going to work? When I look back – I'm a city girl, I'm an entrepreneur. I'm about to start another company. And then put me in the middle of friggin nowhere and then to have a man that would not give at all!" she said at the time. Since the show finished, season three wild child Craig Keller is living a much different life. Last year, he revealed to Now To Love that he had a "new girlfriend [Katie], a new job as a youth worker and I'm starting my own clothing line." "I've known her since school and about six weeks ago we ran into each other and hit it off," he said of his fiancee and mum of Penny during the interview. "We've spent every day with each other since." Keller credits MAFS for giving him a newfound sense of maturity, which is particularly handy since Katie has two kids. Fast forward 12 months and Craig and Katie are still together - and, drum roll please... engaged! In fact, in addition to this happy news, the pair welcomed a beautiful baby girl, Penny Lane, on December 21 2018. Nick and Sharon were the rare unicorns of season four and were, for a while, the only remaining couple that had any success in the outside world. When NW caught up with the pair before their split in July 2017, Sharon revealed she was ready to move interstate from Perth to Melbourne for her man. "I've just rented out my house and chucked all my furniture in storage so I can get up and leave whenever. It's all happening – I'm ready to go," she had said. The pair have even talked marriage and babies. But then it all came tumbling down and the pair split. 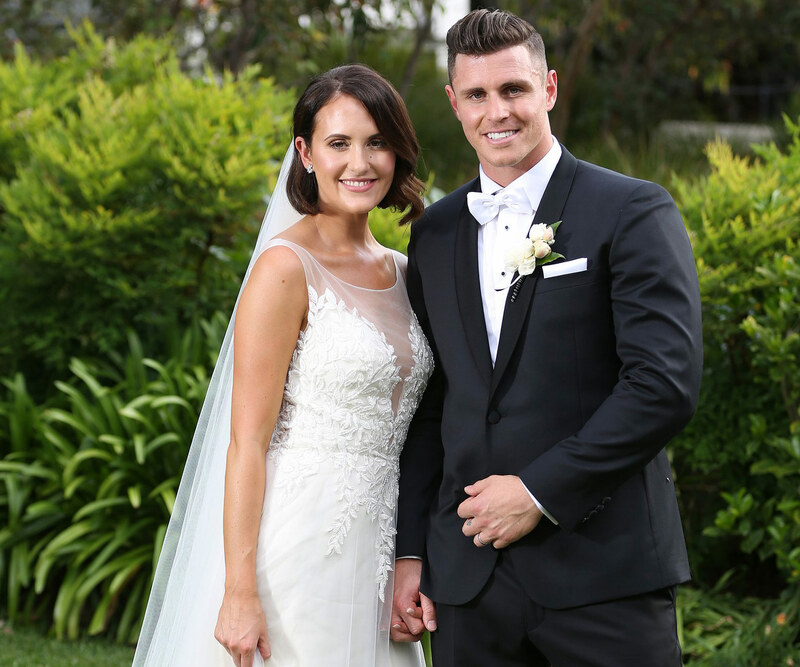 In an interview with OK!, Sharon - whose twin sister Michelle joined her on MAFS – says that while the two had great chemistry, she was constantly questioning whether they were truly in love. "We connected, we had chemistry. Does that mean we are soul mates and forever lovers?" Shaz asked. "That was my question and the only way I was going to get that answer was for one of us to sacrifice everything and move for the other." As the poster couple for the show in season one, stars Zoe Hendrix and Alex Garner were set out to prove not all reality TV romances had to end in flames. Their love story became even more special after they welcomed their first child, daughter Harper-Rose in November 2016. For Zoe, she couldn't believe how well her blind marriage on the Channel Nine dating show ended up. "I think it would be a crazy dream to think you can go on a reality TV show and actually meet someone and fall in love and have a family. If you told me that before, I would have said you're crazy!" Zoe mused. Alex is besotted with his little girl and says his partner is an incredible mother. "Zoe was made to be a mum. She's the most perfect little thing I have ever seen. She's stolen my heart in so many ways. I just feel like the luckiest man alive," Alex told Woman's Day. Unfortunately for the pair, the couple parted ways mid-2018, shocking fans around the country. In a heartbreaking Instagram post, Zoe revealed that Alex was the one to initiate the break up. They now co-parent Harper. Our hearts broke for her when she was dumped on TV by husband Dave. But fast forward to 2018 and Jess Wardrop is loving life. The 2016 bride has not only left her MAFS days behind her but has just become a brand new mum! On January 1, Jess and her partner, introduced the baby via Instagram with the sweet caption: "2018 you saved the best until very last." When Now to Love caught up with Jess in 2017, the beloved break-out star from season three was still working in banking while building up an Instagram empire of devoted followers, who love following her health journey. "I'm focusing on my health and fitness. After the show, I had so many women who felt pressure to look a certain way. I wanted to be that person who is real while also trying to be the best version of myself," Jess explains during our chat. As the only remaining couple from the series, the nation were extremely happy to hear that Erin Bateman and Bryce Mohr's love is still going strong despite rumours they had broken up. "I don't think it's normal. I know personally people who portray their relationship on social media as this fairy tale, who are some of the most miserable people I've ever met, in terms of relationships." In Bella Frizza's case, she had to kiss a Michael to find her Michael and then find a Matt! The bubbly blonde admits that despite her TV romance to Michael fizzling out, Bella first found love with a new man named Michael and then her current beau Matt. Back in 2017, she described her life as "amazing! It's the best I've ever felt." "I'm just so confident with who I am right now and I probably wasn't back then," Bella admitted. After her year long relationship post MAFS, Bella has since moved on with Radio Presenter, Matt and from what it looks like on Instagram - the pair look pretty smitten! As for her MAFS ex, she is grateful for the entire albeit bizarre experience. "I was pretty selfish before the show. Because I was single for so long and just being thrown into a marriage and having another person there made me realise it's not just about what Princess Bella wants. It's about two people!" Things quickly went pear-shaped with her TV husband Jesse Konstantinoff but Michelle has well and truly moved on. After a whirlwind fling with MAFS season two contestant Jono Pitman, the blonde bombshell has since found love with firefighter Adam Medwick. Michelle recently debuted her blossoming romance on social media with a loved-up snap. Looking back on her experience, Michelle is ready to move on from it all. "That's in my past now and I'm ready to move on with my life. I've been ready for a while," she told OK!. She now runs a wine company with her twin Shaz, called - you guessed it, TWiiNS Wine, yet there's no word on her love life as of late. Make-up artist Simone Brennan shocked viewers when she decided to end her faux marriage to self-confessed footy head, Xavier Forsberg, citing the fact he wasn't affectionate enough. And it was a decision she never once looked back on. Now, Simone pours her energy into her health, happiness and career. The former bride launched an exciting new make-up business, which according to her Instagram account - is going great guns! With no new word on her love life, we look to a past interview with Now to Love in 2017. "Love cannot be forced - it'll just happen when it happens. Once we wrapped filming, my whole approach to dating changed. I shifted my focus from being in a relationship with someone, to being in a relationship with, well, me!" "I placed more attention on my career goals, furthering my education and taking care of my health, opposed to spending any spare time I had trying to find Mr Right," Simone said.